My psych background in undergrad comes in handy at times, especially when I am working with a couple that is trying to improve their communication. 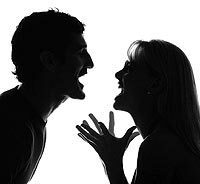 In any relationship, conflict is inevitable, but sometimes it can escalate quickly and painfully toward a shrill and painful screaming match that leaves everyone angry and frustrated. In such instances, I often discuss strategies for de-escalating such conflict before it gets to the point of no return: 1) take a fifteen minute break before coming back and addressing the problem more calmly; 2) instead of responding in kind, stop, sit and try to really listen; 3) while your partner is talking, instead of preparing your self-justifying retort in your head while your partner is speaking, try to prepare a paraphrase of what the other person is trying to say so you can share it when they are finished and then ask if you got it right. Such strategies do not come easily or naturally, but given time and practice, they can change the way we relate to one another. Just yesterday afternoon, I was privileged to gather with both singles and couples to discuss and reflect on the vocation of marriage. During the course of the study, we read and discussed Romans 12 and how this passage might inform and shape not only the common life of the church, but also the life of our families and the relationships we have with those closest to us. The insights shared were challenging and thought-provoking. As we read verses 9-13, I was struck by the call to “outdo one another in showing honor.” Here Paul describes a positive type of escalation in the way we relate to other people. Instead of escalating conflict, trying to get one-up on our loved ones by presenting the better argument or having the wittier come-backs, we are challenged to enter a different type of competition – trying to outdo one another in showing honor. What would happen if we started developing simple strategies for doing that? Whether it is a spouse, a child, a co-worker, or a neighbor – how might our daily relating and loving change if we were to give daily thought and reflection to how we could love and honor in more concrete and tangible ways? If you already know that at the end of a long work day the person you love may well come home exhausted and on edge, what might you do to throw them off balance, surprising them with honor? If you are already deeply aware of the frayed nerves that come from trying to be a full-time parent who pays the bills, cleans the house, feeds the family, and is supposed to wear a constant smile while doing all the above – how might one respond to such sacrifice with a zealous affection that praises such commitment and acknowledges its value? I don’t know if I have the answers for how to do all of this better, but I am giving it some thought as I write – and with God’s help, I am going to start – as early as today – trying to escalate honor.